I've heard so much good about Matilda the Musical. Ten Olivier nominations and seven wins. People I know telling me it's amazing and I'll love it. MusicalTalk, a musical theatre podcast I like, praising it in their episode Matilda: We're Crazy for You, calling it the best British musical ever. Of course I went to see the show when I was in London. I haven't been this disappointed in a musical in years. I keep referring to the MusicalTalk review, I'm afraid, so maybe take a listen after you've done reading. It simply fascinates me how differently they see the show from me. I can't believe they compare Matilda to Book of Mormon. I of course haven't seen Book of Mormon, I've just listened to it. But just judging by what I hear, I dare to claim that Broadway's newest hit musical is clever, hilarious, offensive and filled with catchy tunes. After having seen Matilda, I have no idea where the comparison comes from. West End's newest hit musical tries very hard to be funny, gives the watcher a pile of hasty plot threads to suffer through, and doesn't leave a single one of its songs playing in your head after you leave the theatre. I guess Roald Dahl was everybody's favourite author when they were kids, and messing with a classic is always dangerous... But Matilda wasn't an especially important Roald Dahl book for me. I loved George's Marvellous Medicine, The Twits, Esio Trot, The Witches especially... But I only read Matilda on my own after I had grown too old for bedtime stories. Still, while it's not an especially nostalgic book for me, it's a nostalgic enough to make me slightly angrier than I would be if I had only read it in preparation for seeing the show. The most striking problem in Matilda, to my mind, was how awkward the pacing of the plot was. I hadn't read Matilda in years when I went to see it, and here's what I remembered of it (here be spoilers, if your childhood reading didn't include Matilda): Matilda is a very smart girl who reads a lot and can move things with her eyes. Which part of that sentence sounds the most interesting to you? I don't know, maybe you're a fan of bookworms, but I was certainly looking forward the moving-stuff-with-a-glance action. To my disappointment, the whole eye thing was rushed through in about six minutes near the end of the second act. Same thing with the whole Miss Honey sideplot. Instead, they wasted precious time with an unrelated intervention by the Russian mafia. What. 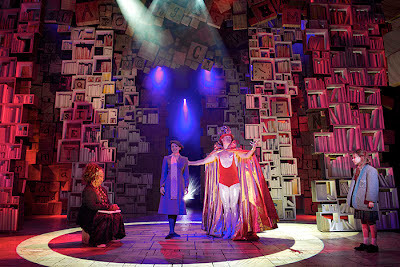 A story that Matilda was telling to Mrs. Phelps, a librarian, and to herself when she was feeling upset, took up a big part of the show. I think it was an useless add. I found it boring as tar, for starters. What's more, I disliked how they had changed Mrs. Phelps's character. In the book, she was a voice of reason, the only adult nice to Matilda before Miss Honey. In the musical, she's so silly she hardly qualifies as a grown-up. In short, I felt hardly anything happened in the first act and too many things in the second. I thought the songs suffered from the same problem as songs in Ghost did: they didn't move the story forward but brought it to a screeching halt to indulge in loud music and spectacle for three minutes. Then the dialogue started again and the plot got going. It's easy to make this mistake in musicals with lots of dialogue, which is one of the reasons why sung-through shows are my favourites. In many cases, the songs in Matilda had hardly anything to do with the plot. The song Loud for example: Matilda's mother and her dancing partner/lover/whatever sung about how you can't be like Miss Honey to succeed in life but must be like Mrs. Wormwood. I found it painfully unnecessary. The moment is in the book, sure, but it's a part of a bigger scene: Matilda's parents explain why they dislike Matilda so. No explanation existed in the musical, and they wasted the perfect chance to put it in. Why. I've heard praise for the lyrics and suppose they were clever - I didn't understand half of them from first time hearing. That always happens to me with Sondheim, who's often thought to be the cleverest lyricist around, so I guess Matilda is lyrically on a good level. I don't even mean this ironically. I just mean that, as a person whose native language isn't English, it was occasionally hard to understand what they were singing. I don't have a single bad thing to say about the kid actors. They were all so young, and I sat there thinking that they're already more talented in what they do than I'll probably ever be in anything... They did an amazing job, every single one of them. They deserved every shreak and clap they got from the audience. I'm happy the musical drew some influence from Quentin Blake's illustrations when designing the characters. Blake's amazing illustrations are, to me, an essential part of any Roald Dahl story - I remember getting Charlie and the Chocolate Factory from the library and feeling brutally cheated when I noticed the book lacked pictures. Glad to see the people behind the musical didn't ignore them! 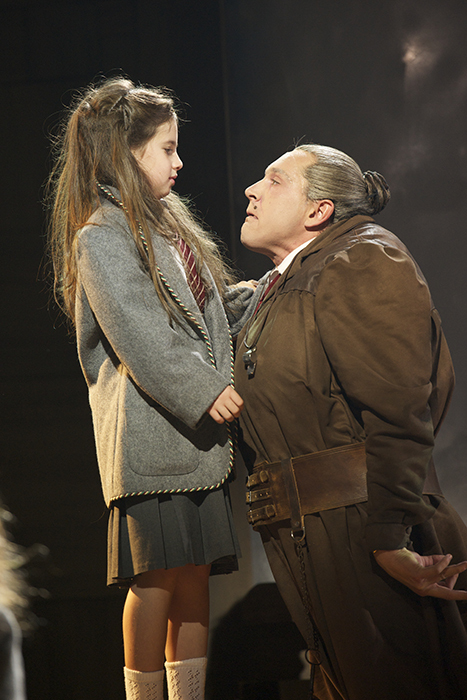 Mr. Wormwood looked like he had escaped Blake's sketchbook, and Miss Trunchbull also came disturbingly close. Some of the other visuals and tricks were amazing, too. The moment with lasers is one of the neatest-looking things I've ever seen in theatre. I don't want to spoil it, I'll just say that there's also a stunt involving a kid that made my jaw drop. But here we are, comparing Matilda with Ghost again: astounding visuals can only go so far if the piece in itself is flawed. Since Matilda is so loved by everyone else than me, I guess everybody should see it for themselves if they can. It truely might be I'm the only one who dislikes it. But here you have it, MusicalTalk: there's at least one person who hasn't been won over by Matilda the Musical. 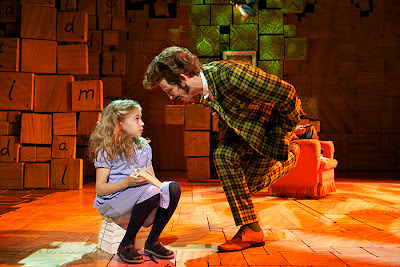 Pictures from Matilda the Musical's image gallery. I have actually read some mixed comments especially about the music, so you're not alone there, though apparently in the minority. I can't remember where I read those comments, but somehow I was very surprised when I read about all those Olivier awards it got. I am intending on seeing 'Matilda' on Sunday (we are hoping to get day-tickets) and I am intrigued to see it mainly because of the positive reviews it has received. In reference to what you said about the music, Tim Minchin who is behind it is one of those people who is brilliantly funny but I can imagine that the humour may be heavy on word-play and language tricks which would make it less accessible for non-native English-speakers. But I'll go and see the show first and I'll report back what I thought about it! :) Everyone has praised the child actors as well as Bertie Carvel so looking forward to it. I remember reading 'Matilda' and seeing the film as a child and I really loved both of them. :) It was merely my personal opinion that it's one of the best British musicals to come along in a long time. Not being a fan of ALW or Elton John's scoring efforts, it's a refreshing change. Also - no British musical in my lifetime has received pretty much unanimous reviews from every national newspaper, more Olivier Awards than any other show in British history or (pretty much) praise from anyone who sees it. Do listen to our interview with Dennis Kelly - it may answer many of your questions you have with the show! Hi, glad to see you here! Actually, I suppose I haven't seen all that many new British musicals (my West End visits have been very classics-oriented, and Finnish theatres aren't currently wild about producing new British shows) - so who knows where I'd rank Matilda after seeing more... Also, sorry for the BOM confusion, it seems I understood that part a bit wrong. But hey, no problem! I love listening to MusicalTalk while I draw stuff - besides writing, my dearest hobby -, it greatly helps me concentrate! "I thought the songs suffered from the same problem as songs in Ghost did: they didn't move the story forward but brought it to a screeching halt to indulge in loud music and spectacle for three minutes. Then the dialogue started again and the plot got going. It's easy to make this mistake in musicals with lots of dialogue, which is one of the reasons why sung-through shows are my favourites." This comment is the biggest issue I take with your review. What about the song "Quiet"? Matilda explains exactly how she comes to do magic. She is so angry that suddenly everything becomes crystal-clear so much that she can command other objects with her mind. If anything, that song explains far better than words how and why Matilda can do magic. "Naughty" drives the plot forward SO much. While Matilda is mixing her Dad's hair gel, she sings about her motivation behind that decision; "Cause when you are little you can do a lot. You mustn't let a little thing like little stop you". That philosophy and decision to take situations into her own hands drives the REST of the musical. "My House" so beautifully articulates Miss Honey's character. She is a simple but kind woman who, due to her past, values the simple things in life. She has escaped abuse and now can make herself tea when she likes; she has a fire to keep her warm and cosy at night. "It isn't much but it is enough for me. Cause this is my house". So, so beautiful, it makes me cry when Lauren Ward performs it. I could continue listing songs but hopefully I have drawn your attention to only a few that are CERTAINLY more than loud, irrelevant noise. I admire that you have laid out your reasons for not enjoying the show; everyone is entitled to their own opinion. But, I wonder, whether you felt any of the songs above (at the very least) carried the plot forward and communicated the heart of the play even better than the spoken word? But even though you're right, some of the songs actually add something to the story, the score as a whole didn't feel very ingrained to the plot to me. Out of the songs you mentioned, I think Naughty worked out the best. I'm afraid I found My House a bit boring. Anyway, going to read your review as soon as I can. It'll be interesting to take a look at a perspective different from mine! PS: Luisa, with whom I reviewed the show in the episode, merely compared it to Book of Mormon because, up until that point, BOM was the best show she'd ever seen. That's the only reason it was mentioned. Matilda is nothing like BOM. Agree with you too about the unforgettable songs and indecipherable lyrics - however witty they may have been i could hardly make them out. Nice to know not everyone adores it! Give us our Tanssi back!